Cory’s shearwaters (Calonectris diomedea) escorted us out to sea as we left the harbour of Santa Cruz de la Palma on the Canary Islands. 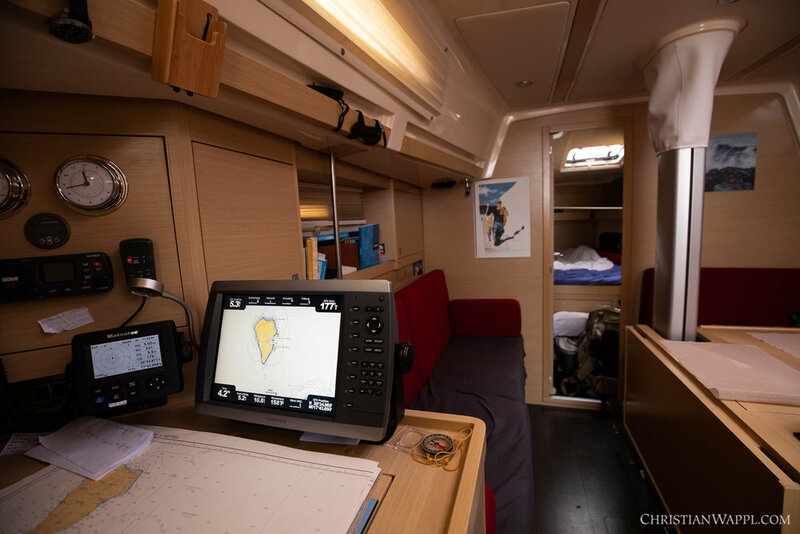 I was with my parents, both of them veteran sailors, aboard their new vessel, the S/Y Imagine. 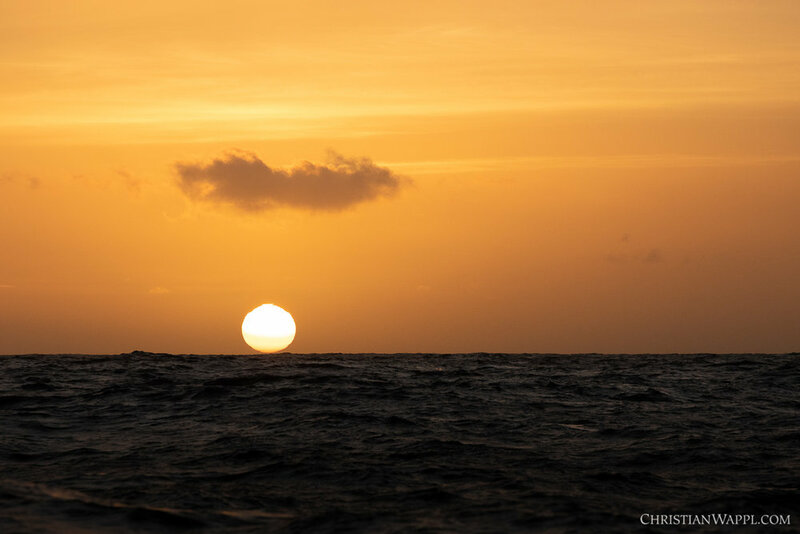 Our destination was Grenada, separated from us by approximately 2.600 nautical miles (4.800 kilometres) of open ocean. I had spent my childhood on a yacht not unlike the Imagine, but around twenty years had passed since I’d crossed an ocean for the last time. As we sailed further and further from the island, the wind picked up and the internet reception began to falter. I said goodbye to civilisation and settled down in the cockpit. Night had fallen and a dazzling array of stars was visible. As my father joined me on deck, our conversation gravitated towards the stars and we pondered the possibility of alien life. Later, I moved back below deck and tried to find sleep. The ship and the waves created a myriad of creaking, clanking and sloshing sounds, but I was dead tired and none of these sounds kept me from sleep for long. 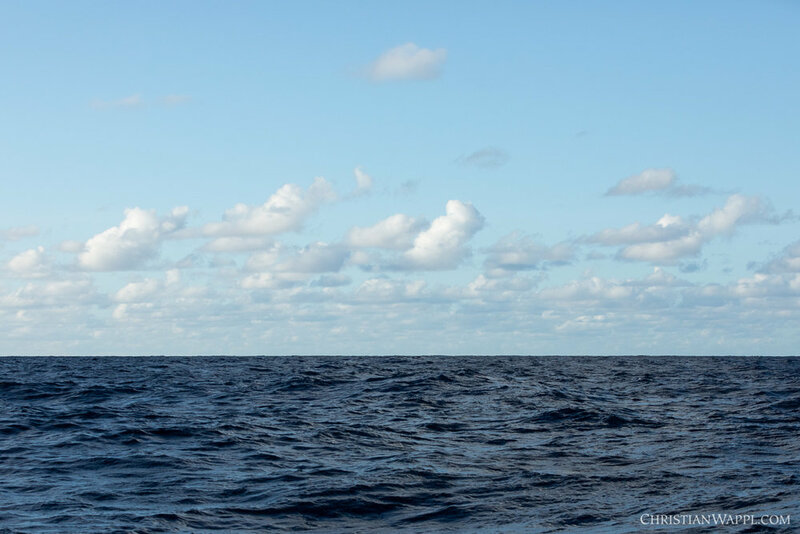 The wind was in our favour, and the rest of the day passed uneventfully as the boat sped along. In the evening, the creaking and sloshing sounds were joined by angry gusts of wind. I couldn’t help but imagine them as the lost souls of those taken by the Atlantic Ocean. As I settled into a restless sleep, I wondered how many the ocean had claimed over the millennia…hundreds of thousands, millions? 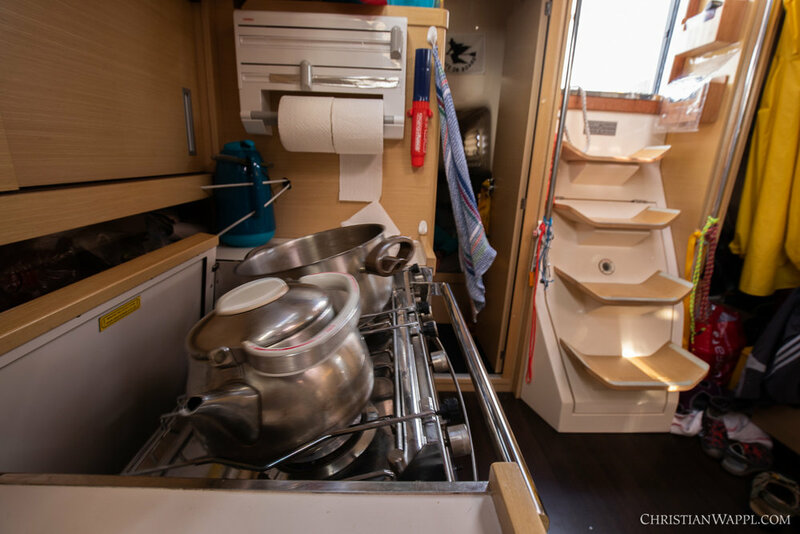 Thanks to the self-steering gear, the Imagine kept her course mostly by herself, and accordingly, there was little to do besides some occasional changes to the sails. Despite this, none of us got bored easily. 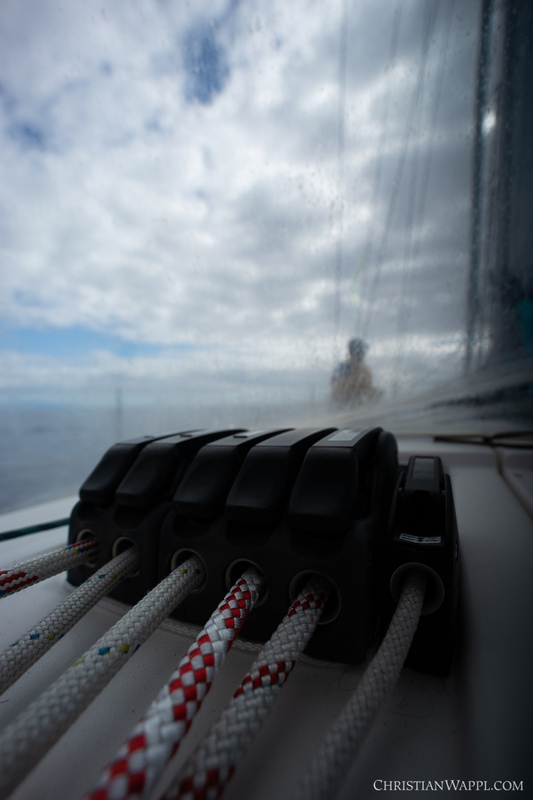 The rocking motions of the boat tired us out, and we slept intermittently throughout the day. In one of my waking phases, I started thinking about our freshwater reserves. 350 litres had sounded like a lot, until I visualised the 300 litre aquarium that used to stand in my living room. Suddenly, it seemed like a very small supply of freshwater for crossing an ocean of salt. How many days would we last with 350 litres if I used water as liberally as usual? By now, I had become well accustomed to life aboard. Anticipating and compensating for the ship’s movements had become second nature, staring at the computer screen no longer made me feel sick, and my sleep requirements had normalised as well. In the morning, a tropicbird (Phaeton sp.) investigated the Imagine. Later in the day northern storm-petrels (Hydrobatidae) showed up, as well as larger, unidentifiable seabirds in the distance. The winds alternated between moderate and practically non-existent, and we switched between sails and the boat’s engine accordingly. 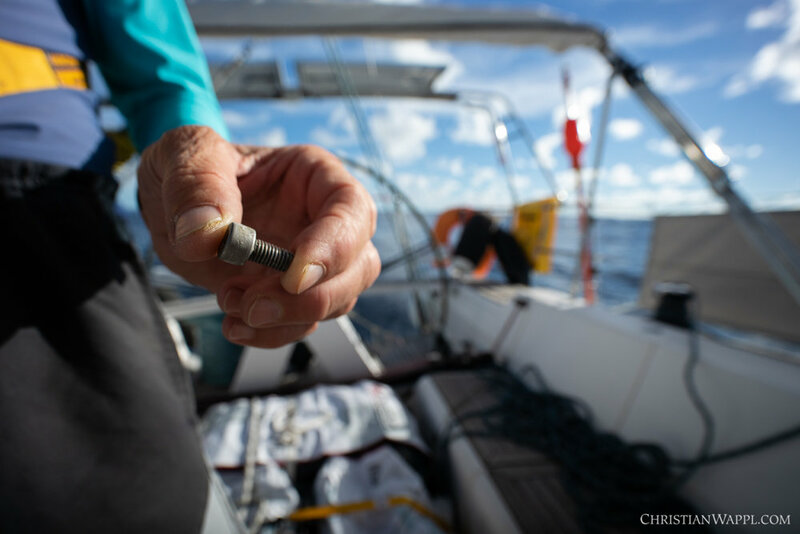 Ominously, a bolt had come lose overnight and was found on deck, but it was quickly returned to its correct place. Shortly before lunchtime, a ship came within viewing distance during daylight for the first time. 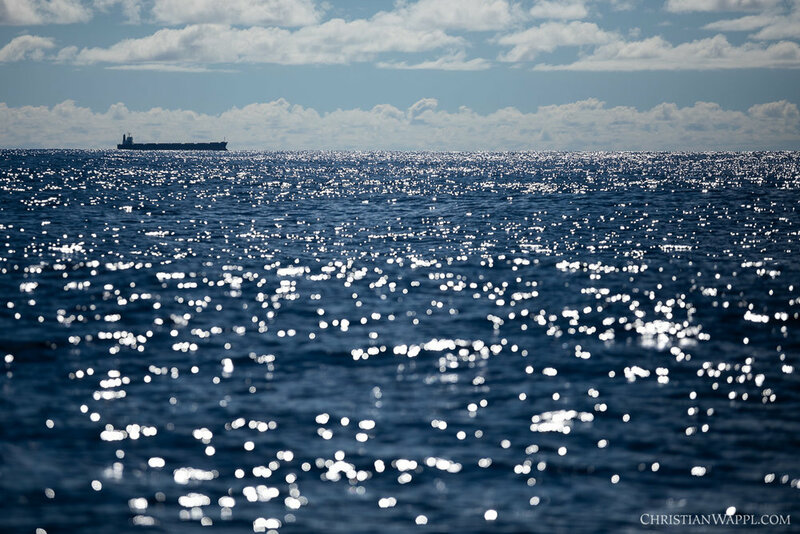 The Automatic Identification System (AIS) had already alerted us to its presence and informed us that the vessel was a cargo ship: the Ligari, 225 meters long and bound for Itacoatiara, Brazil. Carried by most ships, the Automatic Identification System (AIS) is an automatic tracking system that gives others detailed information on the identity, size, speed and more via VHF. Some hours later, we passed a pod of short-finned pilot whales (Globicephala macrorhynchus). Angry skies with dark clouds greeted me in the morning. The winds were back, albeit not from the ideal direction. 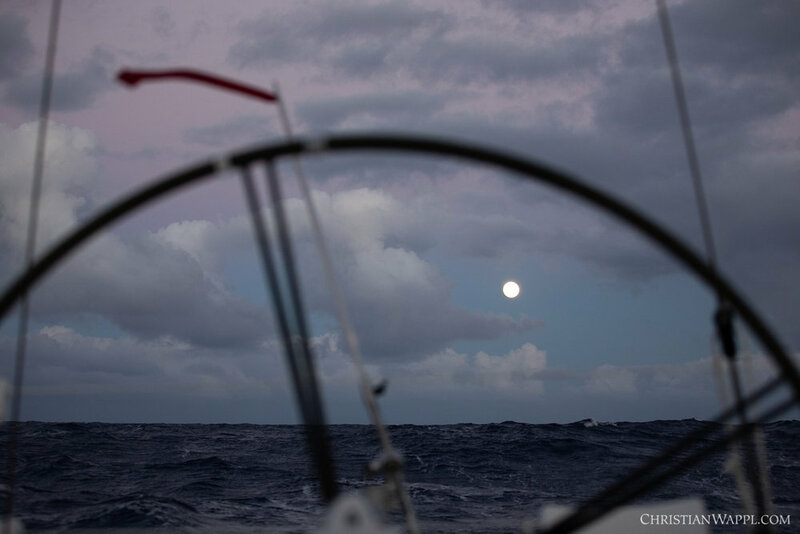 Nevertheless, we were happy to reach speeds over five knots again. 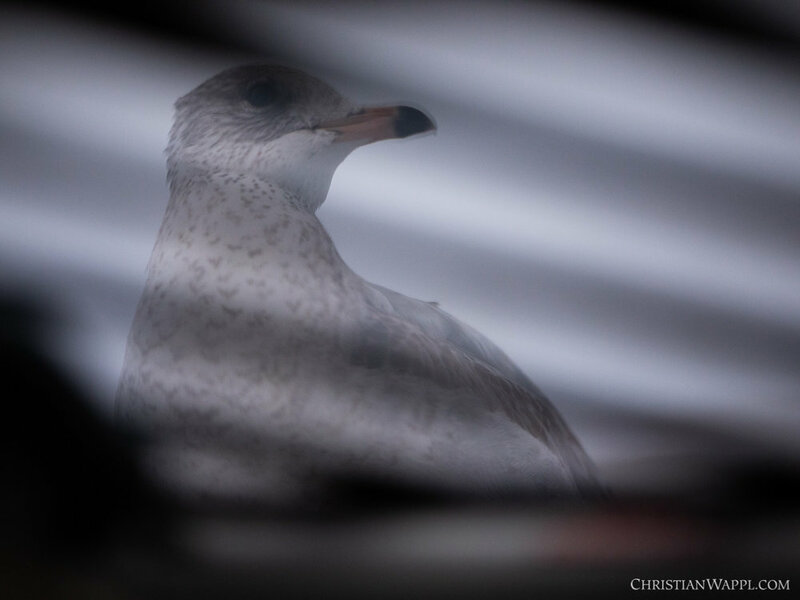 A juvenile ring-billed gull (Larus delawarensis) circled the Imagine in the afternoon and settled on her deck some time later. 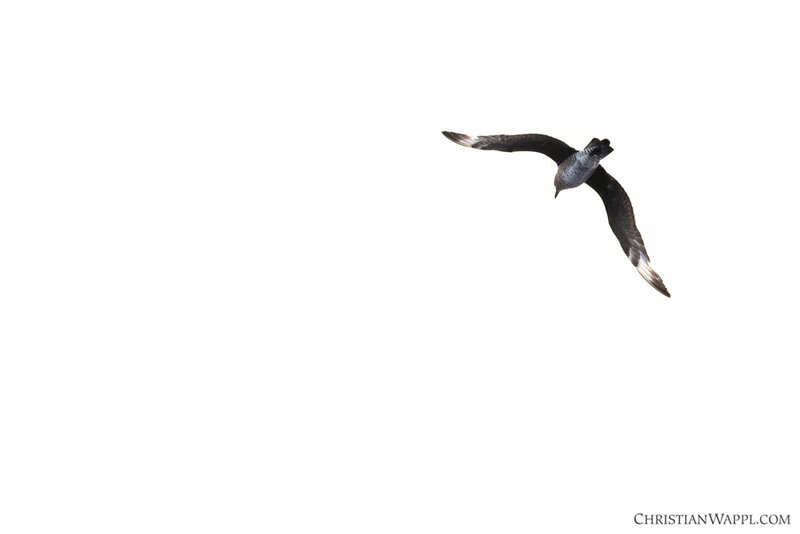 Gulls are not birds of the high seas, and this one was far away from home. As darkness fell, it settled down near the prow of the boat. The gull was gone. Strong winds had battered the boat throughout the night, and the bird must’ve become scared and flown off into the darkness. A cargo ship had passed by, so there was a small chance it found a new resting place. The next marooned bird didn’t take long to arrive: a cattle egret (Bubulcus ibis). Frightened by the motion of sails and ropes, it decided not to land, even though this species is even less suited to life at sea than the gull. 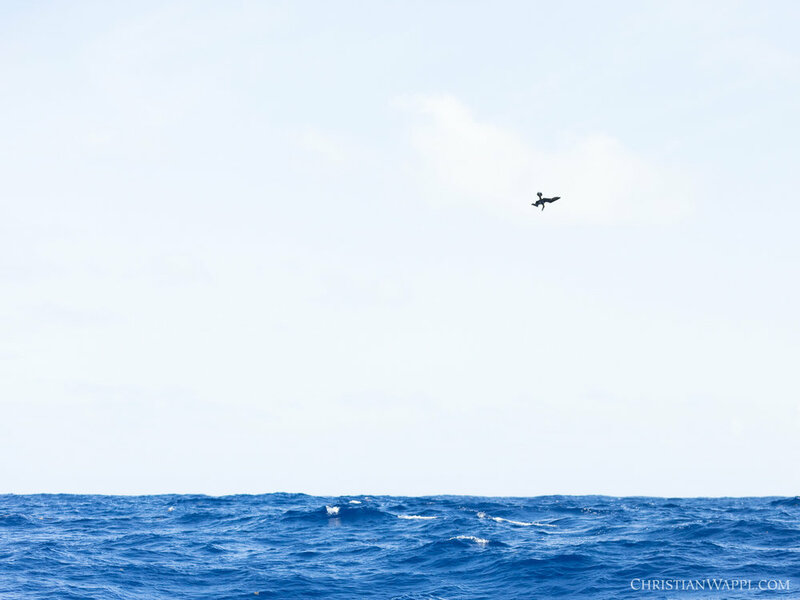 We still encountered flying fish (Exocoetidae) on a regular basis – some of them alive, some of them dead on deck in the morning – but seabirds had become rare. As in the last days, we made excellent progress, and crossed the halfway mark sometime in the evening. However, this came at a price: the Imagine was bobbing and twisting and turning in every imaginable direction, courtesy of the waves. As I was trying to find sleep, I was tossed to and fro, and found myself wishing for a narrower bed. Many of our fresh supplies, including bananas, tomatoes and tangerines, were on the verge of running out. Time at sea would be decidedly less fun without fresh food, and I was glad that we still had apples, oranges, potatoes and pumpkins. In the afternoon, we encountered clumps of Sargassum weed, a floating macroalgae, for the first time. The full moon rose at dusk, a breath-taking sight above the churning sea. It almost made up for what was sure to be another night of short and irregular sleep. The sound of the collision alarm cut through the night at 3 AM. I was fully awake in an instant and frantically scrambled to the AIS in the dark, only to find out that the sound for no GPS reception was identical with the collision alarm. Relieved, I went back to bed for three more hours of uneasy sleep. A brown booby (Sula leucogaster) followed us for some time, hunting the fish we disturbed from the ever-present Sargassum weed. In addition to the small clumps we’d encountered in the last five days, Sargassum mats that covered several square meters were now turning up. Occasionally, some of it would get snagged on the boat and had to be manually dislodged. Dolphins joined us around lunch for a short time. As we steadily approached the Caribbean, animal life grew ever more abundant. A lone parasitic jaeger (Stercorarius parasiticus) hunting around the boat was an interesting addition to the familiar cast of flying fish and boobies. Changes to sails and course kept us busier than in previous days and the genoa sail succumbed to the combination of UV rays and wind in the afternoon. 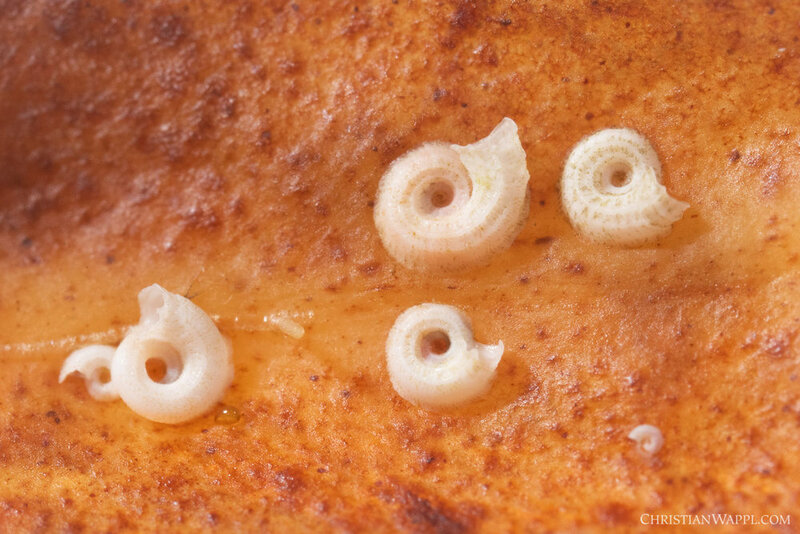 The outer corner was left hanging by a thread. We wrestled the flapping sail into submission, barely avoiding a man-over-board scenario. The sail was then stitched back together by my father and back in action by the time the sun set. In the morning, I spotted the silhouette of Grenada in the distance. Savage rhythms faintly drifted across the sea and slowly grew louder as we approached the island. My first association was a group of cannibals, drumming their heavy war drums, but it later became apparent that a different breed of savages were behind the noise: a cruise ship full of tourists. Shortly afterwards, we entered Port Louis Marina, and passed a number of red-footed boobies (Sula sula) sitting on the buoys that marked the entrance. At 11:30 local time, the Imagine was finally secured in the marina.